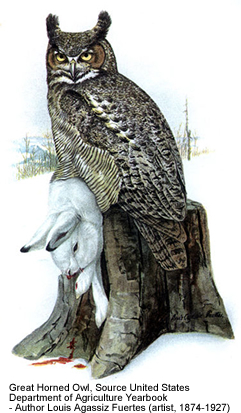 The genus Bubo includes both the Horned Owls (Bubo virginianus) and the Eagle Owls (Bubo bubo). Historically, only owls with ear-tufts were included here, but that is no longer so. The Horned Owls - found in North and South America - were named for their prominent ear tufts that resemble horns. 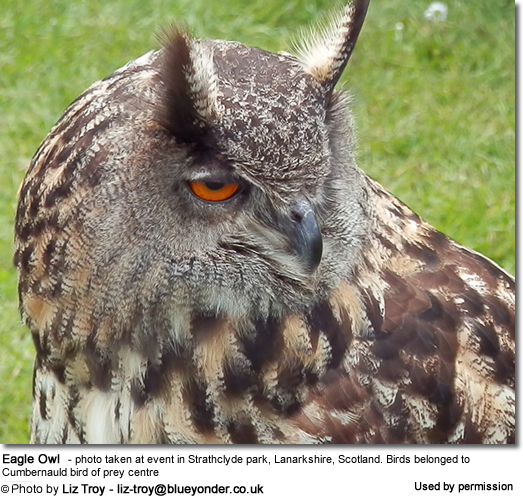 They are among the largest owls found in many parts of the world. Found in the USA, from Minnesota east to Nova Scotia and Prince Edward Island in Canada, south through eastern parts of Kansas and Texas to Florida. South American Great Horned Owl, Venezuelan Great Horned Owl, Colombian Great Horned Owl, Desert Great Horned Owl (Bubo virginianus nacurutu - Vieillot, 1817) - Populations are found in the lowlands from eastern Colombia to the Guianas; as well as in Bolivia across to northeastern Brazil, south to east-central Argentina to about the city of Buenos Aires. Their range stretches from Alaska, south through the mountains to northeastern Oregon and northwestern Montana in the USA. They winter south to Texas. They occur naturally on the coast of southwestern Alaska (Cook Inlet) to coastal central California. Found on the central and southern coast of California south to northwestern Baja Californiaa. Southern Baja California and the Isla (island) Espíritu Santo in the Gulf of California, off Baja California Sur. Found in the deserts of central and southeastern California east to Kansas and south to Mexico, specifically the western parts of the eastern state of Veracruz and the states of Guerrero and Oaxaca in South Mexico. Occur naturally in southeastern Mexico - on the Yucatán Peninsula. Found in Southern Mexico (Isthmus of Tehuántepec) to western Panama. Found in the Andes mountain range of Colombia to Ecuador and northwestern Peru. 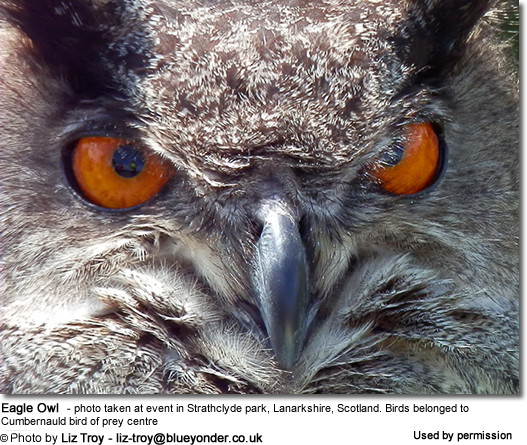 Magellanic Horned Owl / Magellan Horned Owl (Bubo magellanicus - Gmelin, JF, 1788) - full species. Previously considered a subspecies of ssp. B. virginianus or magellanicus. Based on differences in vocalizations and behavior, and also established by DNA, this race was separated. Range: From Central Peru, western Bolivia and western Argentina, south to Tierra del Fuego and Cape Horn. Breed in the Arctic tundra of the northermost stretches of Alaska, Canada and Eurasia; and migrate south to winter in Canada and northern Eurasis. Vagrants have been reproted as as far south as the American states of Texas, Georgia, the American Gulf states, southernmost Russia, and northern China. Range: Europe - from northern Spain through western Europe to western Russia (east to about Gor’kiy). Range: From Western and central China (south to Yunnan and Sichuan) east to Korea. Range: From Romania and southern Ukraine east to Volga delta, south to Middle East (south to central Israel and Jordan) and northwestern Iran. Range: Central Siberia from Ob river to lake Baikal, south to Altai and northern Mongolia. Range: Found in the steppes between the lower Volga River and Ural River , east to Transbaikalia, and south to Kazakhstan, extreme northwestern China (Tarim Basin in northwestern Xinjiang) and western Mongolia. Range: Southeastern Siberia to northeastern China, Sakhalin, northern Hokkaido and southern Kuril Islands. Range: Indian Subcontinent (except Sri Lanka), N to foothills of Himalayas, and western Burma / Myanmar. Bubo ascalaphus desertorum - Erlanger, 1897 - Range: In Africa south of the Sahara to Mauretania and Niger, east to Ethiopia, Arabia and southern Iraq. Cape Eagle Owl (Bubo capensis capensis - A. Smith, 1834) - Nominate Form - Range: South Africa and extreme S Namibia. Bubo capensis dillonii - Des Murs and Prévost, 1846 - Southern Eritrea (Horn of Africa) and Ethiopian Highlands. Bubo capensis mackinderi - Sharpe, 1899 - from west central Kenya south to Zimbabwe and western Mozambiqe. Spotted Eagle Owl, African Eagle Owl (Bubo africanus africanus, Temminck, 1821) - Nominate Form - Gabon eas to Democratic Republic of the Congo (south of the rainforest), southern Uganda and central Kenya, south to the Cape. Bubo africanus milesi - Sharpe, 1886 - SW Arabia, Yemen and Oman. Bubo africanus tanae - Keith and Twomey, 1968 - R Tana and Lali Hills, in southeastern Kenya. Africa from northern parts of Senegambia east to Ethiopia and Somalia, south to Cameroon, northern Uganda and northern Kenya. Africa, in the Usambara mountains of northeastern Tanzania. Reports also from the Uluguru Mountains and possibly in the Nguru Mountains. Spot-bellied Eagle Owl, Forest Eagle Owl (Bubo nipalensis - Hodgson, 1836) - Nominate Form - Himalayas from N Uttar Pradesh E to SW China (Yunnan), S to Cambodia and Vietnam; also S India in Western Ghats and Tamil Nadu. Bubo nipalensis blighi- Legge, 1878) - Sri Lanka - an island country in the northern Indian Ocean off the southern coast of the India. Barred Eagle Owl, Malay Eagle Owl, Oriental Eagle Owl (Bubo sumatranus - Raffles, 1822) - Nominate Form - extreme southern Burma / Myanmar and peninsular Thailand south to Sumatra, including Bangka Island situated east of Sumatra, Indonesia. Bubo sumatranus strepitans (Temminck, 1823) - Found on the islands of Borneo, Java and Bali (Indonesia / Southeast Asia). Found in Africa south of the Sahara. Dusky Eagle Owl (Bubo coromandus - Latham, 1790) - Nominate Form - Found in Pakistan, northern and central parts of India and southern Nepal east to Assam and Bangladesh. Populations may also be found in east China. Bubo coromandus klossi - Robinson, 1911 - Western and southern Burma / Myanmar, W Thailand. Range: Africa - from Sierra Leone and Liberia east to Ghana, and southern Cameroon and northern Gabon east to to northern Democratic Republic of the Congo. Akun Eagle Owl, Sooty Eagle Owl (Bubo leucostictus - Hartlaub, 1855) - Distribution: In Africa patchily distributed from Sierra Leone and Liberia east to Nigeria and Cameroon, south to the mouth of the Congo River, Cabinda and probably northwestern Angola, and across northern Democratic Republic of the Congo. Philippine Eagle Owl (Bubo philippensis - Kaup, 1851): Nominate Form - An endangered and rare bird species found near lakes in lowland jungles in the Philippines islands of Catanduanes, Samar, Mindanao, Luzon and Leyte. Bubo philippensis mindanensis - Ogilvie-Grant, 1906 - Samar, Leyte and Mindanao; recently recorded on Bohol. Bubo blakistoni piscivorus - Meise, 1933 - Western Manchuria (west of Great Khingan Mountains). Bubo blakistoni doerriesi - Seebohm, 1895 - Southeastern Siberia and extreme northeastern China, to the Korean border.